Apart from the escalating troubles related to the Citizenship (Amendment) Bill, the persistent ethnic conflict in the State is far from being resolved. The demands of the Hill-based outfits run contrary to those of the majority sentiment of the Valley residents. The initial demand of the Kuki militant conglomerates for a separate State remains unacceptable to the State Government (both the previous Ibobi Singh-led regime and the present one led by N. Biren Singh) reflecting sentiments amongst Valley inhabitants. Thus, Chief Minister N. Biren Singh declared, on February 21, 2018, "We will not accept any demand for creation of a Kuki State. The peace process was initiated by the Centre. The State Government has not been a part of the talks between the Kuki groups and the Centre. The peace pact was signed after the groups had assured that they would not raise the demand for statehood." The Naga Framework Accord and its possible implication on Manipur’s territorial integrity continue to raise suspicions in the Valley Districts. The submission of a report by the Parliamentary Standing Committee on the framework agreement in July 2018, once again, raised alarm. In the report, the Government’s interlocutor for Naga talks, R.N. Ravi, had said that a "special status" would be offered to the Naga people by extending Article 371 (A) to Naga-inhabited areas. On July 16, 2018, Chief Minister N. Biren Singh, however, warned, “If our voice is not heard, if the consent of the State Assembly or of the people is not taken, then we will have difficulties. Then we will have to leave our posts." Less than a month later, on August 10, 2018, eight Imphal Valley-based civil society organisations enforced a half-day shutdown of shops, business establishments, and marketplaces in the city, and also in Uripok, Sagolband and Thangmeiband in Imphal. 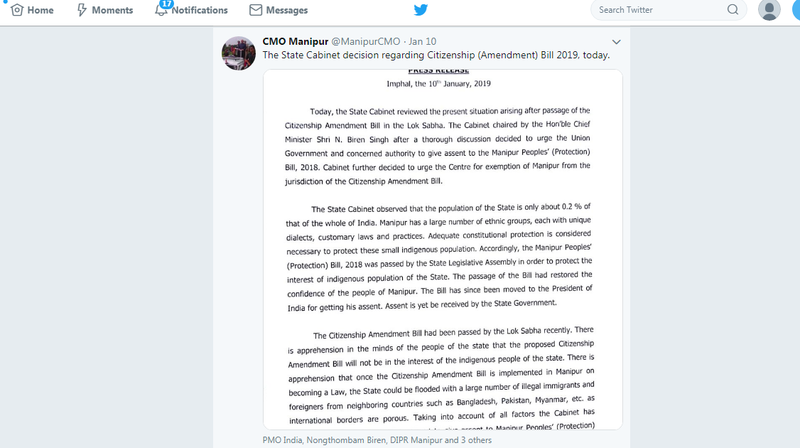 Jeetendra Ningomba, vice president of the Committee of Civil Societies Kangleipak (CCSK), one of the civil societies enforcing the shutdown, stated, "If the article [371A] is applied in the Naga-inhabited areas of Manipur, the State Government would have no right to interfere. This is an indirect submission to the demand for greater Nagaland." Further, the Suspension of Operations (SoO) with the Kuki militant conglomerates Kuki National Organisation (KNO) and the United People's Front (UPF), was extended on September 2018. The SoO Agreement now will be valid till August 31, 2019. The talks with the group, according to news reports, remain at a preliminary stage. KNO ‘president’ P.S. Haokip disclosed, on September 13, 2018, that substantive talks were yet to begin and the groups’ principal demand for a “territorial council” will be placed before the Government whenever the next round of talks are held. Moreover, the issue of the politico-administrative status of the Hill Districts remained unresolved since the creation of new Districts. The 10th round of the tripartite talks between the Centre, State Government, and United Naga Council (UNC), held at the Senapati District headquarters town on September 1, 2018, remained inconclusive. According to news reports, the State Government made a request for more time, during the tripartite talks, to come up with concrete proposals regarding the UNC's demand for a roll-back of the decision Notification of District creation] of the previous Ibobi Singh-led State Government to create seven new Districts in the State in 2016. In November 2018, General Officer Commanding of the 57 Mountain Division, Major General V.K. Mishra observed, "The presence of so many groups adds to the complexity... Given the complexity of the problem, it may take longer to achieve a solution”. The 57 Mountain Division of the Indian Army, based in Leimakhong, is involved in counter-insurgency operations in the State.